The Rosary is a traditional way of praying while meditating on certain key events that define the Christian faith, called “mysteries”. Because of this, the vast majority of the Rosary is based on the recitation of verses from the Scriptures. For example, the Our Father, which is said before the recitation of each decade, is the prayer Jesus himself taught to us – the Lord’s own Prayer indeed; whilst the first part of the Hail Mary is an amalgamation of the Angel's words announcing Christ's birth and Elizabeth's greeting to Mary found in the first chapter Luke’s gospel. The word Rosary derives from the Latin word for a “crown of roses”. And in this sense, the Rosary is an offering we make to God and Our Lady, as if by crafting beautiful and fragrant flower-chains with our prayers. The Mysteries of the Rosary then are the “gems” in our crowns; the events though which God redeemed us in Jesus Christ, and demonstrated his unmeasured love for us. 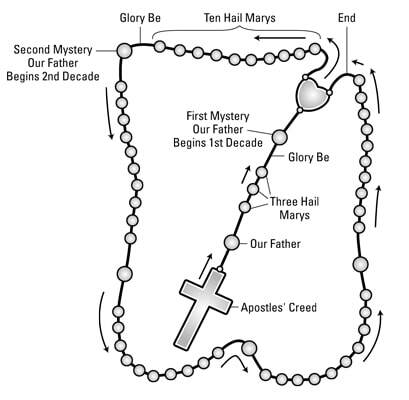 There are four sets of Mysteries: Joyful, Sorrowful, Glorious, and the Luminous.The beads which many people hold whilst praying the Rosary are also sometimes called “Rosary crowns” for this reason. The repetition in the Rosary is meant to lead us into restful and contemplative prayer related to each Mystery; it also helps us to enter into the silence of our hearts, where Christ's spirit dwells. You do not have to be a Roman Catholic – in fact, one of the best books the Rosary was written by a Methodist minister, Five for Sorrow, Ten for Joy: Meditations on the Rosary (J.N.Ward). Praying the Rosary is one of those practical things that take more time to explain how they’re done, than actually doing them. But to put it simply, anyone who knows few easy prayers can pray a Rosary; you will also need to follow the Mysteries to meditate as you pray. If you do not have Rosary beads, it is perfectly okay to count with your fingers. Counting beads frees your mind to help you meditate. Let the beads do the counting, and immerse yourself in the scene described by each mystery, whilst quietly saying the prayers. Holding the Crucifix, pray the Apostles' Creed. On the first bead, pray the Lord’s Prayer. Pray three Hail Mary on each of the next three beads. For each of the five decades, read the Mystery, pause a little if you wish, and then pray the Lord’s Prayer. While moving through each of the ten beads, say ten Hail Mary while meditating on the Mystery. Then say a Glory Be. Additional prayers may be added at this point. After saying the five decades, pray the Hail, Holy Queen, and the concluding prayer. The Archangel Gabriel "announces" to Mary that she shall conceive the Son of God. The Word of God made flesh, God-with-us, is born in Bethlehem. Mary and Joseph "present" Jesus in the Temple where they meet Simeon. Jesus calls to conversion and forgives those who draw near to him. The glory of the Godhead shines forth from the face of Christ. Jesus establishes the Eucharist; “Do this in memory of me”. Jesus sweats water and blood while praying the night before his passion. Roman soldiers crown Jesus' head with thorns. Jesus leaves the Apostles and ascends to heaven. The Apostles receive the Holy Spirit in tongues of fire in the upper room with Mary. Mary is taken bodily (assumed) into heaven by God at the end of her life here on earth. Mary is crowned Queen of Heaven and Earth; and the Saints rejoices for ever in the presence of God.